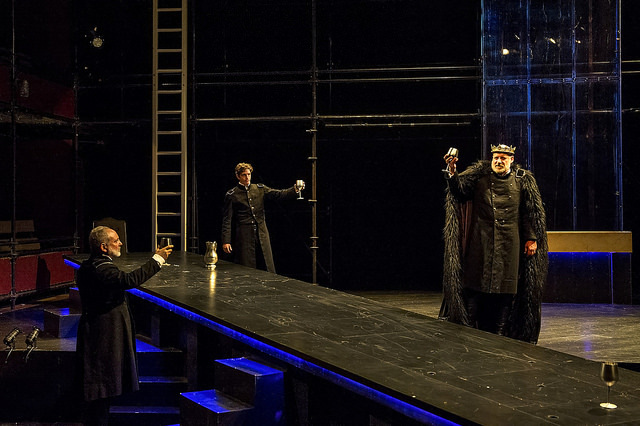 Shakespeare and Company’s Macbeth is magnificent is every aspect: staging, acting, and technical artistry. It is the “Must See” show of this summer. Even for a company renowned for its fine Shakespeare productions, this show is breathtaking. Director Melia Bensussen’s fantastical and frightening vision of the play, in addition to having the performers speak directly to the audience (often from the aisles or seats in the house itself!) draws everyone present into the drama. It is theatrical magic. Hearing some of the Bard’s most beautiful language articulated by each of the fine actors in Shakespeare and Co’s Macbeth is pure joy. No one need worry about understanding iambic pentameter in this production; the words and the meaning behind them are made crystal clear. Jonathan Croy and Tod Randolph are mesmerizing as Macbeth and his lady. They portray a couple eaten alive by ambition and tortured by the excesses of their own actions with passion and subtlety. Amazingly, they bring warmth to these two classic villains, allowing the audience to see some humanity (and even humor) in the characters. Their dark sides are tinged with enough light to make their fates matter. Nigel Gore plays two roles (King Duncan and the Porter) but it is as the latter that he shines most. Hopping directly into the audience and conversing amiably, Mr. Gore makes vulgarity charming and captivating, adding another touch of light to this dark tale. Banquo shows the royalty of his nature in the portrayal by Ella Loudon, whose conviction and faith ring true always. Her facial expressions while listening to Macbeth’s falsehoods speak volumes; she plays the role of loyal subject and hero with every fiber of her being. In other supporting roles, Deaon Griffin-Pressley as Malcolm, King Duncan’s heir, gives a memorable performance in a minimum of onstage time. His speech questioning his value as the future king is stunning. Thomas Brazzle is equally outstanding as the wronged Macduff. His righteousness and anger flare up brightly onstage, in contrast to the dreamy floating wickedness of Hecate, played by Zoe Laiz. (In a clever bit of casting, Ms. Laiz also portrays Macduff’s wife.) And Gregory Boover is versatile and eloquent as several young men, including Fleance and young Macduff. The stark scenery designed by Cristina Todesco includes a two-story stage and a massive raked table, which also serves as an acting platform. This enables the plot to literally spill into the audiences’ laps, as well as pour down from the heavens; the backgrounds are as powerful in this play as the performances. Lighting designer Dan Kotlowitz gives the stage and acting areas throughout the house both brightness and eerie glowing as needed (the blue table lighting is a work of art.) The effects by Sound Designer Brendan F. Doyle include haunting screeches, thunder, rainstorms, Scottish music and echoes seeming to come from everywhere at once, and the sumptuous costumes by Olivera Gajic add glamour, grandeur and frequent goriness to this impressive Shakespeare production. All this and more await at Shakespeare and Company’s Macbeth! Don’t miss it!